With the nation’s economy still struggling and unemployment still high, economic concerns continue to top the public’s policy agenda for President Obama and Congress. More than eight-in-ten cite strengthening the economy (86%) and improving the job situation (82%) as top priorities. These numbers have fluctuated only slightly since the start of 2009. 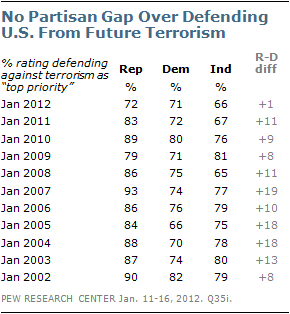 Nearly seven-in-ten (69%) say protecting the nation from terrorism should be a top priority, not much different from one year ago (73%) but down from 80% at the start of 2010. Still, terrorism has been at or near the top of the annual priorities list since it was first included in 2002, shortly after the Sept. 11 terror attacks. Concern about the nation’s budget deficit, on the other hand, has been increasing in recent years. 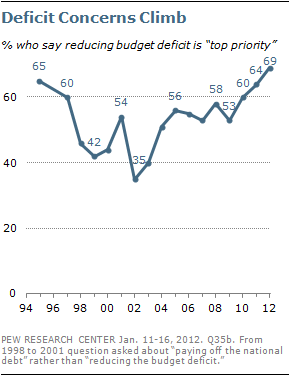 Currently, 69% say reducing the deficit is a top priority. In January 2009, only about half (53%) rated this as a top priority. The proportion citing the deficit as a top priority is now on par with the number that said this in December 1994 (65%), during Bill Clinton’s second year in office. Reducing the deficit or paying off the national debt became less of a priority in the late 1990s as the nation – and the federal government – benefited from a strong economy. Concern was also modest in the early years of the Bush administration, especially in the immediate aftermath of the Sept. 11 attacks. But concern about deficits has increased steadily since 2009. Still, strengthening entitlement programs continues to be important for most Americans: 68% say securing Social Security is a top priority, while 61% say this about the Medicare system. In both cases, those numbers are little changed in recent years. 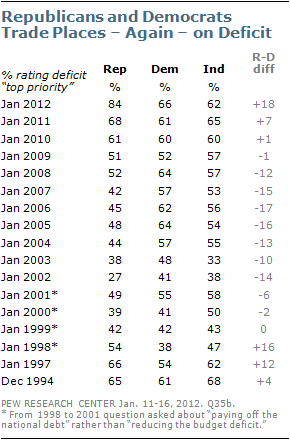 In addition, nearly two-thirds (65%) cite improving education as a top priority, again little changed in recent years. About six-in-ten cite making the tax system more fair (61%) or reducing health care costs (60%) as top priorities. Dealing with illegal immigration remains a lower priority and concerns have fluctuated in recent years. Currently, 39% say dealing with illegal immigration should be a top priority, down from 46% in 2011; it stood at 40% in 2010. 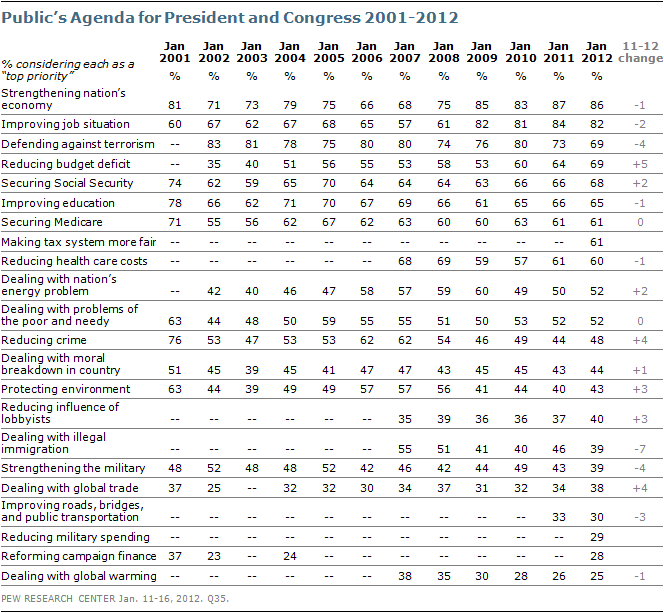 In 2007, a majority (55%) said dealing with illegal immigration should be a top priority. More than eight-in-ten Republicans (84%) say reducing the federal budget deficit is a top priority, up 16 points since last January and the highest percentage in a Pew Research Center survey. During the Bush administration, at most only about half of Republicans viewed reducing the budget deficit as a top policy priority. In January 2009, shortly before George W. Bush left office, 51% of Republicans rated reducing the deficit as a top priority. That percentage jumped 17 points (to 68%) by January 2011 and has increased by about the same amount (16 points) in the last year alone. Democrats’ concerns over the deficit also have risen in recent years, though less sharply than Republicans’. Currently, 66% of Democrats say reducing the budget deficit should be a top priority for the president and Congress, up from 52% in January 2009. Nonetheless, Republicans are far more likely than Democrats to rate the deficit as a top priority. It is often the case that members of the party out of power express greater concern over the deficit than do members of the party in control of the White House. Throughout most of the Bush administration, more Democrats than Republicans rated reducing the budget deficit (or paying off the national debt) as a top priority. In 1997 and 1998, during Bill Clinton’s second term, more Republicans than Democrats viewed these issues as top priorities. There continue to be substantial partisan differences over other policy goals as well. Nearly six-in-ten Democrats (58%) say protecting the environment should be a top priority for the president and the Congress, compared with just 27% of Republicans and 40% of independents. Democrats also are far more likely than Republicans to view improving the education system (28-point partisan gap), dealing with the problems of the poor and needy (27 points) and dealing with global warming (27 points) as top priorities. 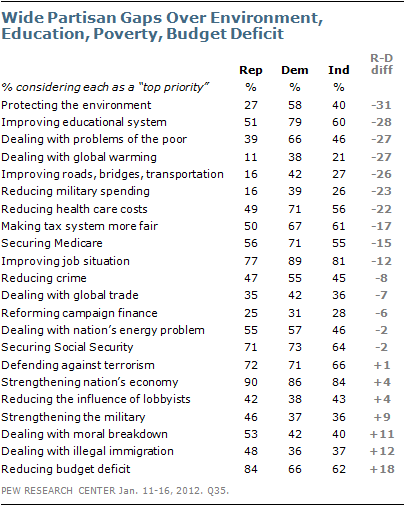 Nearly four-in-ten Democrats (38%) say dealing with global warming should be a top priority, compared with just 11% of Republicans and 21% of independents. Republicans, on the other hand, are more likely than Democrats to say that reducing the budget deficit (18-point partisan gap) and dealing with moral breakdown in the country (11 points) are top priorities for the president and Congress. Republicans are less likely to view illegal immigration as a top priority than did so last year and the gap with Democrats has narrowed. About half of Republicans (48%) view dealing with illegal immigration as a top policy priority, down from 61% in 2011. Among independents, the number saying this is a top priority also fell, from 47% to 37%. Democrats’ views are largely unchanged (36% today, 33% last year). Nearly identical percentages of Republicans (72%) and Democrats (71%), along with 66% of independents, say that defending the country from future terrorist attacks should be a top priority for the president and Congress. There was a wide partisan gap over the importance of this issue during much of the Bush administration. And as recently as last year, Republicans were more likely than Democrats to rate defending against future attacks as a top priority (83% vs. 72%).